Well, I didn't get any sewing accomplished this weekend after all. Dang. Instead I went to the shooting range with my Mister*. We had a blast! (hee! I'm punny!) Truthfully, I'm a regular little Annie Oakley and am, as Mister said, "very impressive" with a gun. Gun slinging notwithstanding, I was still able to cross off some items on my to-do list this weekend. 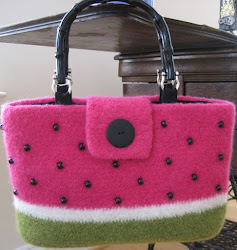 2: * I've uploaded the Watermelon Hat video! It's taken most of the day to upload via Youtube- I guess HD has it's drawbacks. Seeing myself in HD....not as traumatic as I anticipated. Thank the Lord for Oil of Olay. The second video is edited and has been published; I think I'll upload it to Youtube tonight since it'll probably take a good 8 hours to finish. *Ok, the video was still processing as I was finishing up this post. It's been 7 hours since I first uploaded it to youtube. I've just been notified that it's been rejected because it's too long. WHAT.THE.WHAT?!? So, I wasted 2 hours in publishing time for both the videos, plus 7 hours of uploading/processing time. Which means that, in addition to re-editing the videos, I still have another 2 hours of publishing time tomorrow and then approximately another 15 hours of uploading time. A.R.G.H!! 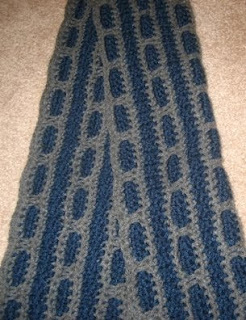 3: A couple of months ago, my Mister asked me to make him a scarf. 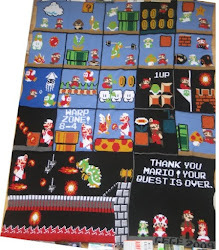 I know- he already has the coolest scarf ever so, what could he possibly want another one for? Well, the Mario Scarf is a tad too thin for him and, since we've apparently been relocated to the arctic this winter, he wants a warmer one. But, more importantly than that, HE REQUESTED A CROCHET ITEM! So, I told him that I could make him one like my circle scarves- except in manly colors, of course. He shot that one down- thinks it'd still be too girly. Drat- now I've got to think. Fast forward to yesterday. 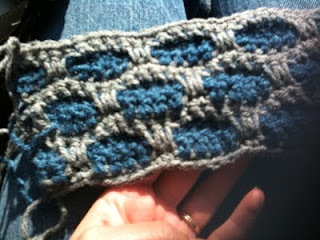 I've got a bit of time in the car while we're driving to/from the range, so I start tinkering with some yarn. I've had this idea for a while and I really like what it's looking like. I think it looks like bricks- bricks that a manly construction worker would be working with. *Insert Tim Allen grunt here. * He likes my swatch at first, but then decides that it's not exactly what he's looking for. I text this to my sister asking, "Is this a manly scarf?" Mister likes it!! So, this is my Mister Scarf. Kinda looks like tire treads to me. I'm working on the hat, so I'll get a better picture soon. Oh, btw--I started my very own blog, was inspired by you!! It's kind of fun to read that others have crafty dilemas and cool ideas! Very nice. I like the treads. Love your stuff. Thanks Alicia and Karen! Re etsy: I find that if I advertise around, I do better. There's just so much on etsy that the chance of someone stumbling across it randomly is pretty slim. Also, I've found that outside of the crafting world, not many folks have even heard of etsy. I have my site listed on my card, but it's usually by word of mouth. However, I'm going to start focusing on selling patterns rather than FO. I've sold quite a few FO, but, again, it's been by word of mouth and usually out in my area. 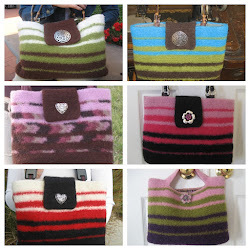 I've been contacted by others via my blog for a custom order, which is always nice. :) I'll be sure to check out your blog! !